The joystick has dominated the new-product/technology news in the propulsion world, especially in the last two years. Expect its presence to continue to rule at the Fort Lauderdale International Boat Show. Engine companies and manufacturers of helm controls and transmissions have pumped out product steadily since Volvo Penta introduced its IPS pod drive system with joystick in 2005. The Mercury Zeus pod and joystick was introduced in 2007. Manufacturers are now turning their attention to joystick control at higher speeds, developing the tools and technology that enable owners to run their boats like pros when they push the throttle. Other technology at the command post to make driving easier includes the emergence of automatic trim tabs that adjust for list and running angle. It’s all pretty cool stuff. Click play for a look at what&apos;s to come in Fort Lauderdale. I have tried Joystick Driving on two boats. It’s ideal for long-distance boating. Working with the autopilot, Joystick Driving should reduce a skipper’s physical and mental stress. Joystick Driving steers the boat, but has no throttle control of forward and reverse propulsion. It can work with Volvo Penta and Garmin’s new Glass Cockpit engine/navigation/vessel systems monitoring technology. Four of the major outboard engine makers offer joystick helm control. 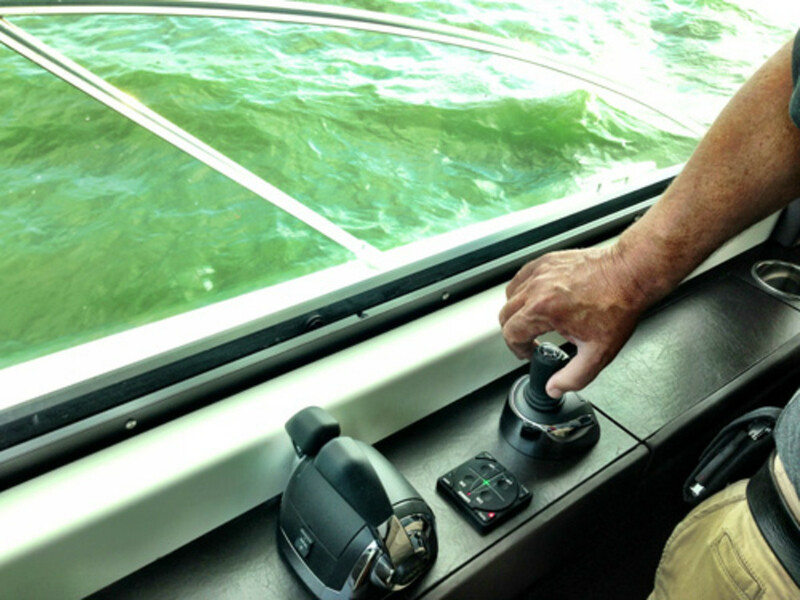 Mercury’s Joystick For Outboards was launched at the 2012 International Boatbuilders Exhibition and Conference. The joining of joystick control and outboards continued this year. Suzuki Marine became the fourth major outboard manufacturer to offer the technology. It will be available with the DF250AP and DF300AP 4-strokes and the company’s drive-by-wire system (Suzuki Precision Control). Only Honda is without a joystick option. I am trying to find out from the company whether it has plans to unveil such a product at the Fort Lauderdale show, which runs Oct. 31-Nov. 4, or in 2014. Remember that the joystick also can be used with sterndrives and conventional straight-shaft inboards with bow thruster assistance. And then there are "joystick-type" systems. For instance, the Nordic Tug 39 Flybridge is equipped with a dock control panel from Side-Power that gives the skipper command over the bow and stern thrusters. Here are some of the boats at the show with joystick helm control: the Riviera 565 SUV with twin IPS900s; the Prestige 450 and Fairline Targa 48 Open with twin IPS600s (435 hp); the Pursuit 365i with Yamaha Helm Master (twin Yamaha F350 4-strokes); the Tiara 50 Coupe with IPS950s (750 hp); the 50 Eastbay SX with IPS950s (750 hp); and the Viking 42 ST with twin 600-hp Cummins with Zeus pods.